I’ll admit it was tough seeing The Swords of Ditto all the way to the end. The colorful, cartoon animation-style PC and PS4 adventure game threatened to challenge my patience once I discovered achieving its true ending would require multiple playthroughs. It’s hard enough getting me to finish a game with one ending, and I’ll sometimes quit ones I’m enjoying for no real good reason. But there was something about its charming world, with rude characters living in an apocalyptic age with one town as a last bastion of humanity, that really drew me in. 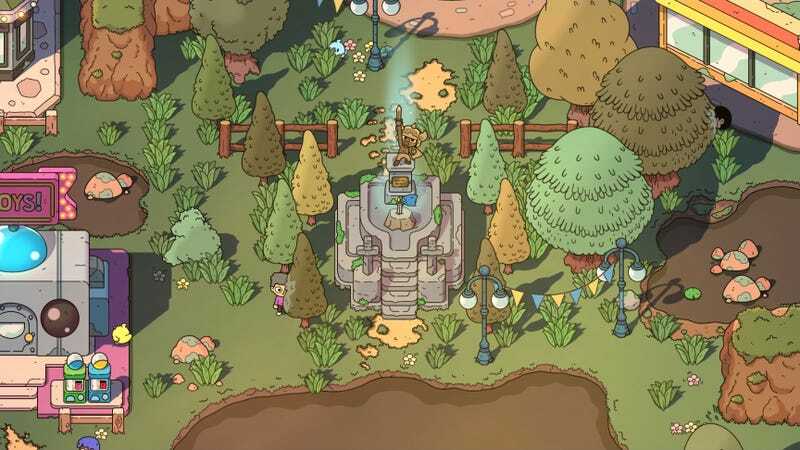 In a nod to The Legend of Zelda series, The Swords of Ditto’s Trial Dungeons are designed to utilize specific items (toys, in this case) to solve its puzzles. The toys themselves are acquired in separate locations called...Toy Dungeons (hey, they are what they are). It’s these dungeons where things get truly interesting. Inside a Toy Dungeon with cats who dive into portals in the floor. Flip the switch and they get stuck. My favorite thing to do. To add even more intrigue, there are tablets that players find throughout the game. They detail Ditto’s history, a story of war, Ancient Ones, a dying civilization of Arcadia, and a series of trials inhabitants are made to endure to test their abilities in the dungeons your character explores. I loved the details and clues waiting to be uncovered that had me guessing all the way to the end. The result was a great twist once the puzzle came together which genuinely surprised me. And I adored that the game set it up so that you’re the true antagonist as Fate, and as the player, you are an unwitting participant on an adventure towards your own redemption. Ditto, as it turns out, isn’t even real—at least not the iterations players come to know during the course of the game. The “Ancient Civilization” of Arcadia is not a thing of the past but a present reality where its people are on a path of collapse, and embroiled in a civil war, all thanks to you. Oh, hey. Turns out I’m kind of a jerk! What’s Your Favorite Game Ending?